HMS Kent was a Monmouth class armoured cruiser built for the Royal Navy at the turn of the last century. Armed with fourteen 6-inch guns she took part in the Battle of the Falkland Islands in 1914, pursuing the German cruiser SMS Nurnberg in the South Atlantic before sinking the enemy ship. Click here for further details and photos. Built and owned by Steve and Nick Brown. Built in the 1930s as part of the modernisation of the RAF Marine Craft Section, this class of work boat replaced the early 56ft Pinnaces which were based upon Royal Navy boats. For more photos and details click here. HMS Niobe was a Diadem class armoured cruiser built in 1897 for the Royal Navy. Typical for RN armoured cruisers she has four funnels and many of her 6-inch guns were placed in casemates. They were the protectors of the British Empire, the presence of an armoured cruiser was more than enough to quell any problems. Built and owned by Tony Newstead. Fuso was the lead ship of the two Fuso class dreadnought battleships built for the Imperial Japanese Navy. Launched in 1914 and commissioned in 1915, she initially patrolled off the coast of China, playing no part in World War I. In 1923, she assisted survivors of the Great Kantō earthquake. Fusō was modernized in 1930–35 and again in 1937–41, with improvements to her armour and machinery and a rebuilt superstructure in the pagoda mast style. With only 14-inch guns, she was outclassed by other Japanese battleships at the beginning of World War II, and played auxiliary roles for most of the war. Fusō was part of Vice-Admiral Shōji Nishimura's Southern Force at the Battle of Leyte Gulf. She was sunk in the early hours of 25 October 1944 by torpedoes and naval gunfire during the Battle of Surigao Strait. 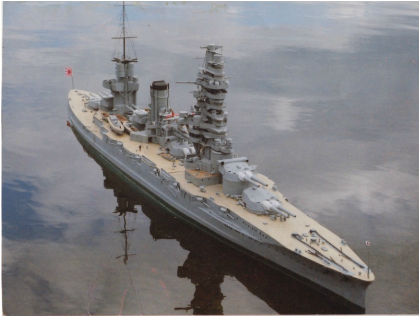 This model has been built as she was in 1934 and on completion she weighed 35,000 tons with a speed of 23 knots. This model like all Tony's ships is scratch built and took 13 months to complete. More detailed pictures to follow. Askold was built in Germany for the Imperial Russian Navy, weighing in at 6000 tons with a top speed of 24 knots. She served in the Indian ocean helping the British Royal Navy hunt for the German raider SMS Emden (also in the club). She was nick-named 'The Pack of Woodbines' by the sailors of the Royal Navy due her funnels resembling the pack of cheap cigarettes that came in fives. She was scrapped in 1920 in Germany. This is a 1/16th scale model of a Landing Craft Mechanical 3 (or LCM3) . It was the landing craft most associated with the Normandy landings. I only took a few pictures of the build, but I think they give a flavour of the quality of the kits components and a method of construction that may well be a first in our hobby. 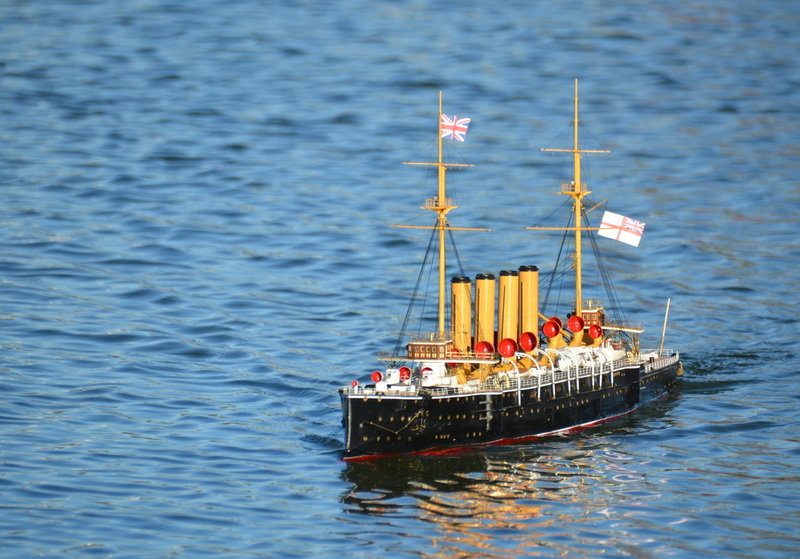 The kit was produced by Speedline Models and made it’s debut at the International Model Boat Show 2011. This particular model is the 3rd one off the production line from an initial batch of 24, the first two going for reviews in the model boat magazines. 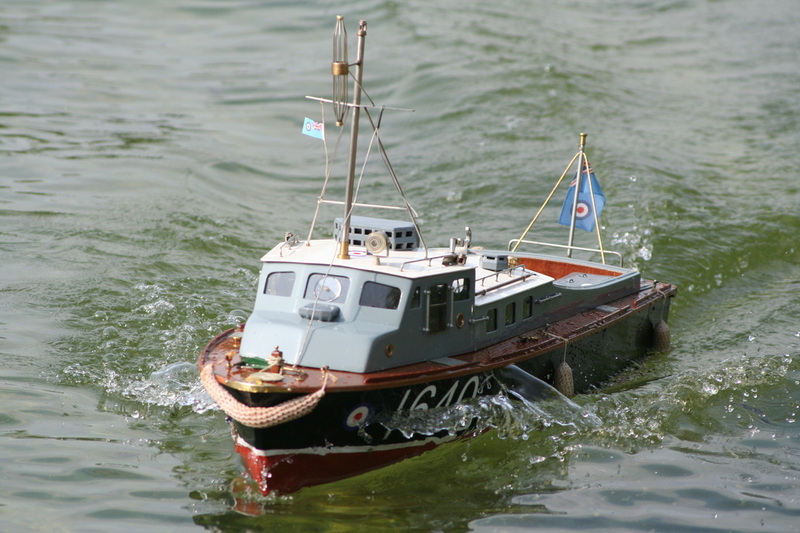 While this particular landing craft was not the first to get its bottom wet, according to Adrian Gosling, the owner of Speedline Models, he thought it was the first to sail, and function correctly both on the water and beached with the gate down, by remote control. Built by Steve and Nick Brown. This is a Revell Flower Class Corvette, originally sold as a static display model by 'Matchbox', they are relatively easy to modify to radio control. At 1/72 scale it's a good manageable size, enough room for working features, which I intend to do with my next flower class. 1/12 Scale , scratch built from M&M plans 412, 37" long, hull and superstructure constructed in birch plywood. Powered by two 12 volt 800 Tornado Electric motors, the model was built approximately 16 years ago. I fully restored this boat approximately 5 years ago. The French Submarine Mariotte was a submarine built for the French Navy in 1908 by Arsenal de Cherbourg. Intended to accompany the fleet, she was designed for high speed on the surface. Although the French Navy was unsatisfied with her performance on the surface, the boat had a higher underwater speed than any French submarine before or during the following 35 years. Mariotte was plagued with engine problems during her construction and the navy spent many years fixing the various issues before commissioning her five years later in 1913. Due to her unusual shape of her outer casing she was nick-named 'Brosse a Dents' or 'Toothbrush'. During the war she participated in the Dardanelles Campaign, but had to be scuttled after she became entangled in the cables of a minefield on her first attempt to penetrate the Dardanelles. This 1/96 scale model was scratch-built by a Model Boat Mayhemer called Tony H.
​The model runs on six AAA batteries and is a surface runner only. HMS Rodney, a Nelson class battleship built for the Royal Navy in 1921 armed with nine 16-inch guns in three triple barrelled turrets unconventionally located at the bow of the ship. Originally the design was based upon the cancelled G3 and M3 battleships which were longer and had turrets at the stern but the Washington Naval Treaty set down limited displacements for new battleships to prevent the naval race which led to the First World War. During WW2 Rodney took part in many naval engagements, most famously in the destruction of the German battleship KM Bismarck . After a very active war she was scrapped in 1948. 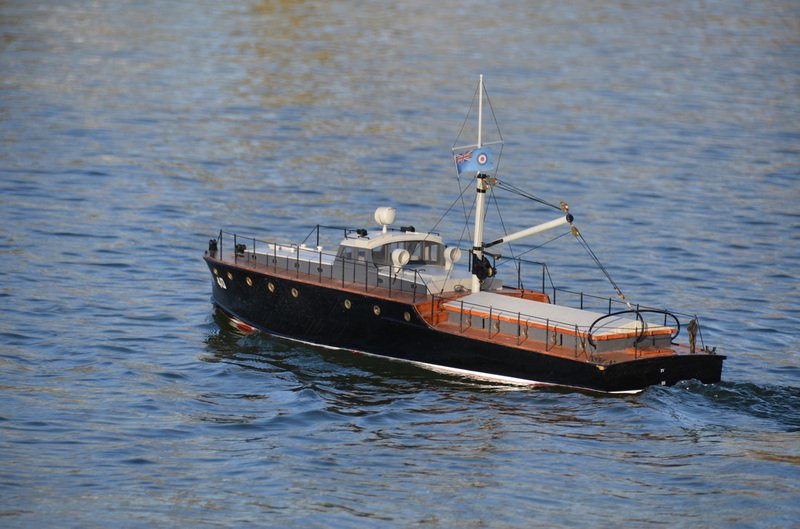 The model is built to 1/96 scale and was Ron’s largest project in which Ron Dean of Dean’s Marine created the mould after Ron approached him on making a GRP hull. Ron Kingdon made the buck and now the hull and fittings are commercially available via Dean’s Marine. HMS Hannibal was one of nine Majestic class pre-dreadnought battleships built for the Royal Navy in 1893-96. Armed with four 12-inch guns in two turrets they laid down the standard for battleship building for the next ten years. Hannibal served in the Channel Fleet and was temporarily painted in an experimental scheme of green which can be seen on Sheila’s model. All the ‘Majestic’s’ served in WW1 mainly as bombardment vessels in the Gallipoli campaign. Most were scrapped in 1920-21. 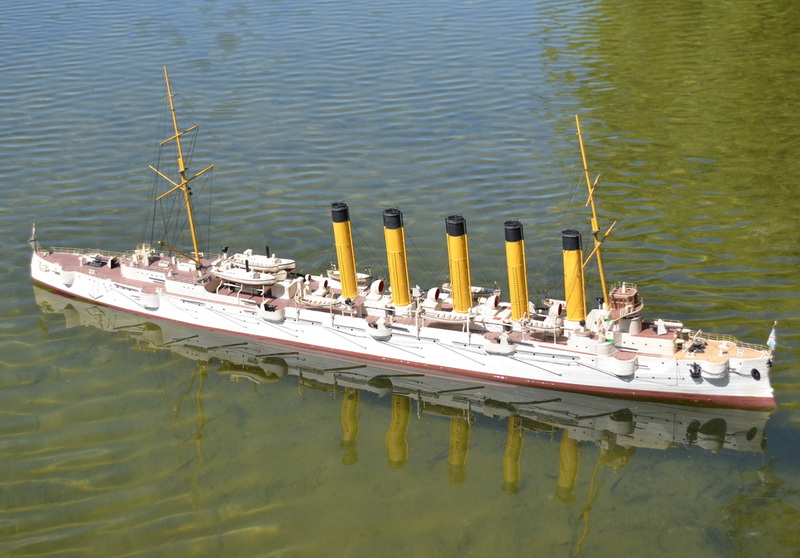 The model is built to 1/96 scale using the Dean’s Marine kit and painted radically in the experimental paint scheme that was applied to her in 1905 for low visibility tests.